On Saturday, September 10, the cross country team opened its season at the thirty-ninth annual Newark Academy Invitational. 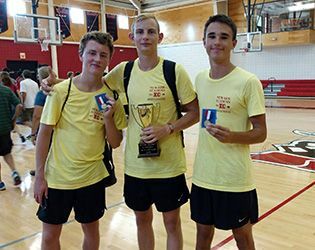 Competing against seven other schools, the boys’ squad claimed third at the event, and the girls’ squad took sixth among eight schools. Adding to the team achievements were two standout performances from the boys’ roster. Senior Mathieu Petit won the event with a time of 17:47 and junior Bobby D’Angelo claimed second, coming in only one second behind Petit. Other notable finishes included senior Nicole Johnson taking eleventh in the girls’ race, with a time of 22:40, and sophomore Matt D’Ovidio placing fifteenth in the boys’ event. The boys’ team, led by head coach Eve Campeau, looks to contend for Prep B and Group B titles this season. The defending Mountain Division champs (6-0) will rely on several key returning runners, as well as some promising newcomers. Among the seniors, Petit and Landon Braemer will be expected to lead the way. From the juniors, the team will look for significant contributions from D’Angelo, Jackson Ensley and Joe Johnson; D’Ovidio and promising newcomer Trevor Wills will be important contributors among the sophomores. Freshman to watch include Luke Mariak, Teddy Lazar and Niels Rongen. The girls’ squad, led by head coach Amy Ulto, will look to several key returning runners, including seniors Sammy Bittman and N. Johnson and sophomores Lilly Cannon, Lily Fischer and Surbhi Srinivas. Newcomers to watch include freshman Devyn Scott, who placed thirty-fourth at the Newark Academy Invitational in her first-ever cross country meet, and Allie Zhao. Last fall, this strong and driven team were Mountain Division champs and this season will look to contend for Prep B and Group B titles.